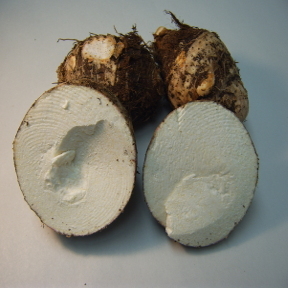 Malanga Islena is similar to a Taro or Cassava, round with horizontal scale like texture. They grow in variety sizes in roundness. Having a woodsy taste and a hint of black walnut flavor. They are a root commonly used in tropical countries, much like the potato is used in temperate climates regions. Especially common in Cuba and Puerto Rico, it is typically deep-fried as fritters or chips. It can also be mashed, baked, boiled, or sautéed. Source: Costa Rica, Panama, Ecuador, Santo Domingo, and Florida. Handling: Stored at approximately 50°F in relatively dry environment.